The trails around the Brainerd Lakes Area were busy with snowmobilers today as the Minnesota United Snowmobile Association’s annual Winter Rendezvous kicked off. Snowmobilers from around the state as well as local and state officials will be participating in the weekend-long event. 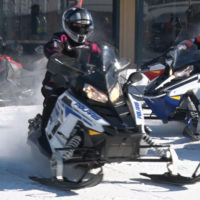 “The Minnesota United Snowmobilers Association has a yearly rendezvous and different clubs in different areas host it for different years,” said Cindy Terwilliger, Gull Lake Drifters Snowmobile Club Member. Over 200 snowmobilers from across Minnesota have descended on the Brainerd Lakes Area for the annual rendezvous. “It’s MnUSA’s winter ride and there’s more riding than anything else. The evening festivities are dinners and awards, but as we go around during the day it’s for rides,” explained Tom Jann, Crow Wing Co. Snowmobile Trails Association Vice President. The association puts on the Winter Rendezvous every year in rotating locations around the state. “It’s just exciting. For me personally, since I grew up in the area and rode these trails for 52 years, it’s so fun to see other people’s reaction to the beauty in another area,” said Teruwilliger. The Crow Wing County Snowmobile Trails Association put on this year’s event that is hosted at Cragun’s Resort. The weekend was kicked off today with a trail ride, making multiple stops along the way. Their first stop was in Nisswa at the Nisswa Chamber of Commerce where they were greeted with hot coffee, treats, and a fire. 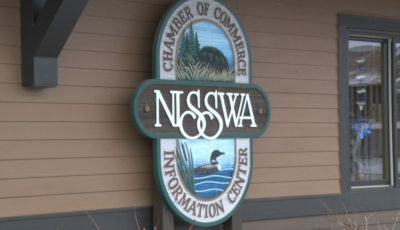 “We always like supporting the community so a lot of the groups they will come to us, and of course we’re all on board to help support and welcome people to our area,” said Heidi Kraemer, Nisswa Chamber Office Administrator. The Winter Rendezvous is a great way for people from around the state to come together over their common interest.